The Albright-Knox Art Gallery continues its colorful public art initiative with the addition of three recent works. 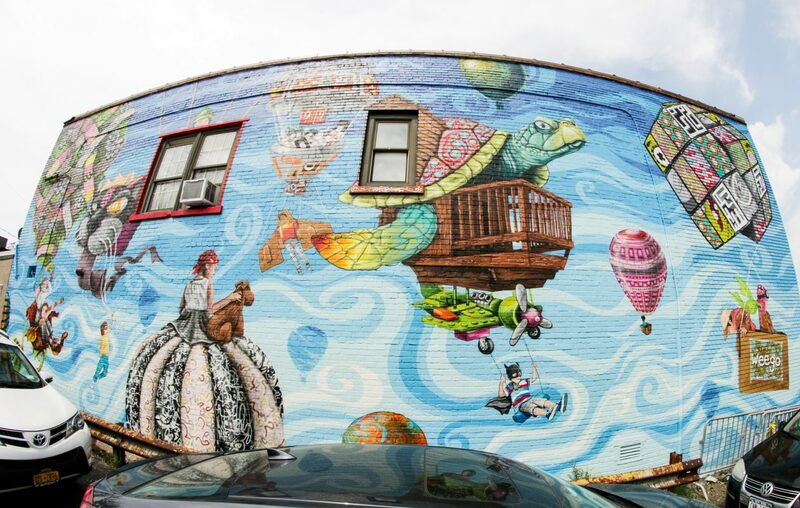 Hertel Avenue’s business district became brighter — and more imaginative — with an acrylic and spray paint mural by artists and longtime friends Chuck Tingley and Matthew Grote. The mural, titled “Weego,” spans the west wall of the Lloyd Taco Factory Hertel Avenue location. Collaborators Tingley and Grote finished their newest creation, which took two weeks to paint, in early June. Also on Hertel about six blocks from “Weego” is “We Are Here,” a graphic streetscape that celebrates a sense of community in the City of Good Neighbors. Buffalo has the second largest Polish population in the country, and the Albright-Knox Art Gallery celebrated that by bringing in Polish artist Wojciech Kolacz to brighten the Broadway-Fillmore neighborhood on the East side, where Buffalo’s first families from Poland settled. It’s located at 617 Fillmore Ave., across from the Torn Space Theater, the location of the former Polish Co-Op Savings & Loan and the Polish Army Veterans Assn. Post No. 1. The building is now owned privately.